There was a time in my life when everything I wore seemed to be black or white. You would look in my closet and most of it was filled with white shirts, black shirts, and some gray shirts. You get the idea. It wasn’t until I started adding color into my wardrobe that I felt so much better! We all need a little color, but that’s not to say that my go-to isn’t still black and white. Colors or not, I consider black and white to be the most versatile colors around. When you wear them you look instantly classic! So for your lack of not knowing how to style white jeans in the winter, I’m sharing with you three tips today on how to wear them and look amazing! 1. Wear winter accesories such as ankle boots. White summer jeans are amazing with sandals and heels. However, if you choose booties you are immediately opening up to the possibilities to face the winter weather. You can still remain completely chic without compromising function or practicality. But of course if you’re like me, you won’t let any little bit of snow stop you from wearing heeled booties, right? 2. Pair it with black pieces. Anytime I’m at a loss of what to wear with my white jeans I instantly turn to black. I love winter whites as much as the next person and think that incorporating blush tones is absolutely beautiful. But if you aren’t quite bold enough to where all lighter colors, adding black on top helps balance out the light on the bottom. It’s even better if you have if your black shirt has lace to blend in the look and prevent it from having such a harsh contrast. 3. Layer up with a warm sweater or coat. This may seem a little obvious, but ladies you need heavier texture to balance out what most would call a summer fabric. If you want to stick with white jeans and not look like you’re still stuck in summer, you need to have something in your outfit that is warmer by appearance. In one of my recent looks (Gray and White City Chic) where I styled white jeans, I layered on the warmer accessories. In this look not only am I wearing a sweater, but perhaps to your surprise I’m wearing a long sleeve shirt underneath! 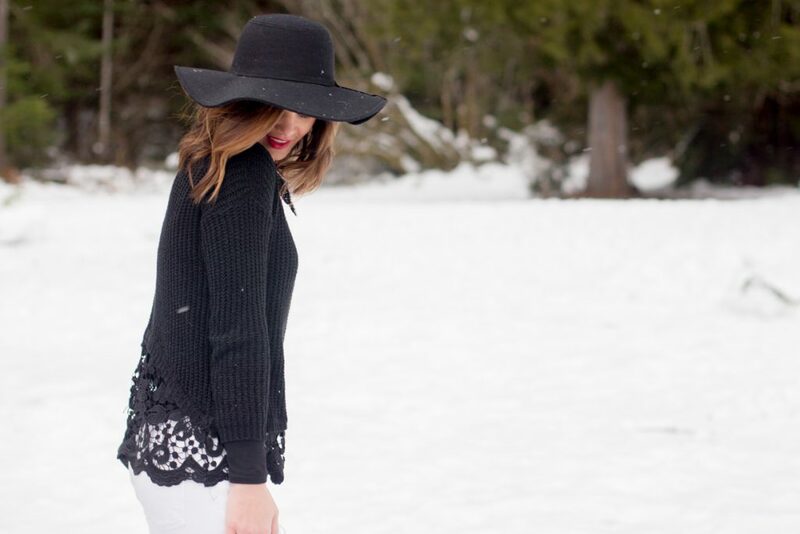 This extra layer helps keep me warm, as well as balance out the lace that shows through. Thank you so much Bailey! You really should try it out! And distressed jeans are a fun way to start too! Thank you! You really should try winter whites! 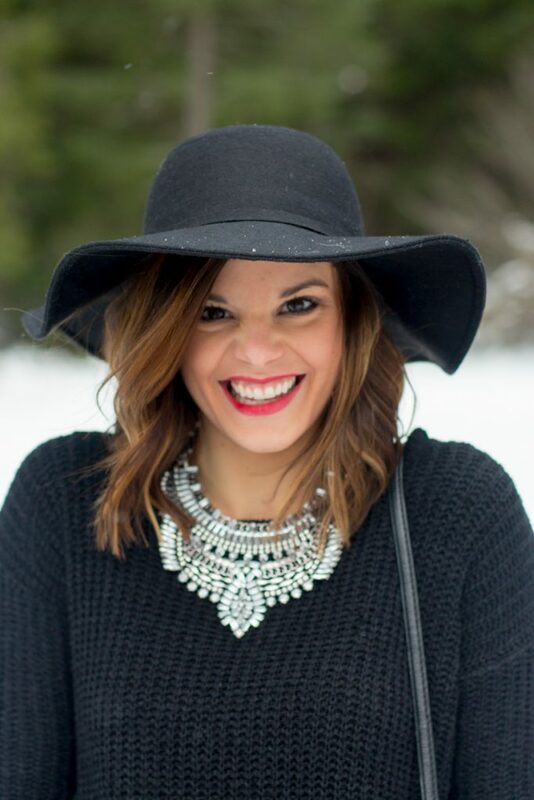 I used to always wear darker colors in the winter, but everyone needs a chance look and feel brighter! I absolutely love this look! And I’m totally impressed that you’re wearing heels while trudging through the snow!! Thank you! I wasn’t technically trudging, just walking on the concrete with a pretty dusting of snow around me 😉 Still had to be careful! Beautiful post! Love this winter look. You are such a fashionista. Love your style! Thanks girl! You are such a fashionista as well! Aww thanks so much Jennifer! good idea, Love ur style, so chic and refined. Thank you so much! What a sweet compliment! You have such great style as well! I can’t blame you for wanting to wear black and white all the time! It’s such a chic and classic combo! Thanks – I’m so glad you agree! I just love black and white! The white and black combination is so beautiful and such a great contrast! Love how the snowy background is the perfect backdrop and reiterates that you can wear white in the winter!! 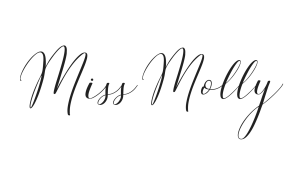 Have a wonderful weekend, Molly! Thank you! 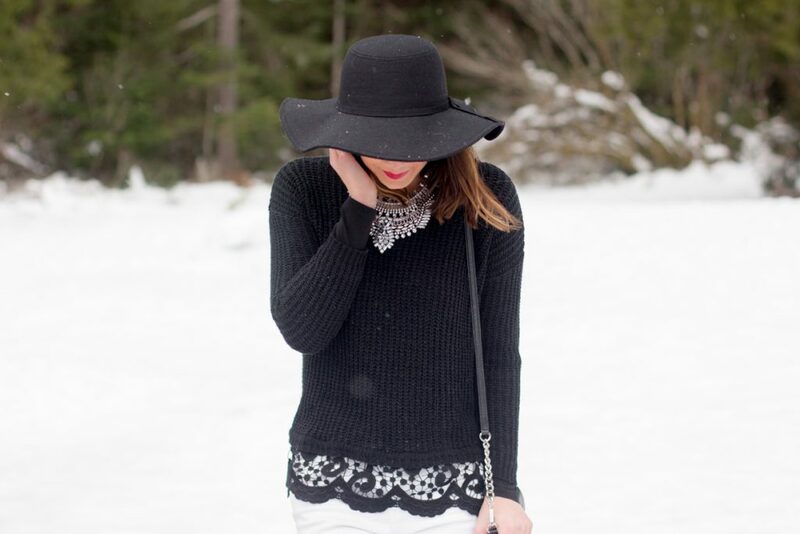 I totally think you can wear white in the winter and black makes a fun contrast! Hope you’re having a great weekend, Lauren! I am so mad I didn’t buy white jeans in the summer now that everyone looks so amazing in them during the winter! Love how you styled them. Thank you so much Amy! You should still be able to find a pair! I got mine at Express! You look great. I haven’t owned a pair of white jeans in while but I do love how clean and fresh they make outfits look! Thank you! They really do make outfits look so clean and fresh! You totally need to get a pair and style them! You’ll love it! Amazing!! I love that your break the traditional “no white after Labor Day” rule. I always hated that! 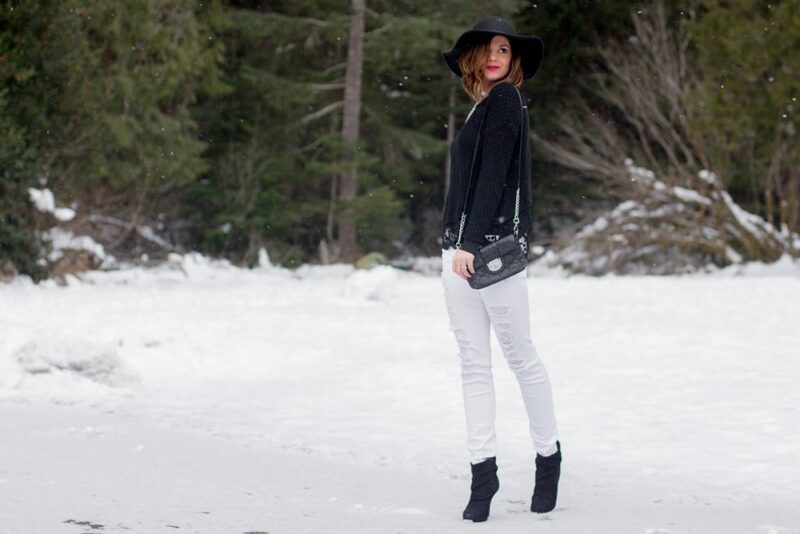 You style these white jeans perfectly. Thanks for inspiring me! Yes! I’m all about breaking fashion rules. Or as I like to say, there are no rules in fashion. Thanks for the compliments! Love your outfit especially your white distressed jeans!! I’ve got a pair but they’re boyfriend fit. I bet the boyfriend fit looks so good! I don’t have a boyfriend pair, but definitely want to try it out! Thank you! Don’t return them! 😉 For sure KEEP them! I love my white jeans! I feel like I’ve worn them more in the winter than the summer! I just need to go get some white jeans! I was loving your layered look with them and this is so great too! Thank you so much! You definitely need to get a pair of white jeans! You’ll love them! Thanks so much Kyla! Hope you’re having a great weekend as well! Thank you! The hat was a last minute addition, but I’m glad I wore it! You’re welcome Rebekah! So glad to have helped. Hopefully you can pull those jeans out this week and have fun styling them! Thank you Kusum! I used to feel that way about white too! Haha, now I realize that I love white either way! That’s so much! Totally made me smile! Hope you had a great weekend! Thanks Shell! It’s totally something that I love when other people do too! Thanks for the love! Thank you Annie! I totally know what you mean, however, it can be done! Just consider it chic camouflage! 😉 Hope you try it! Love this look! Great idea wearing the white jeans in the snow!! Thank you! It’s secretly fashion camouflage! Haha! Thank you, thank you! You’re so sweet! Girly you could so rock white jeans in the winter! Maybe start out with light blue denim, if you’re not that brave though? That’s how I styled light colors in my latest post! Can I just say…you are so beautiful! And I love that top! 🙂 And you are totally rocking those heels in the snow. Can I just say… You are so sweet and totally making me smile! Thanks girl! Thanks so much, Natasha! You are absolutely stunning in everything! Thank you, Shelbi! I’m so thankful you took the time to comment and loved the styled tips! Can’t wait to see how you style white jeans!